The SnO2 is a chemically sensitive metal oxide which has interactions with molecules to be detected in the target gas. 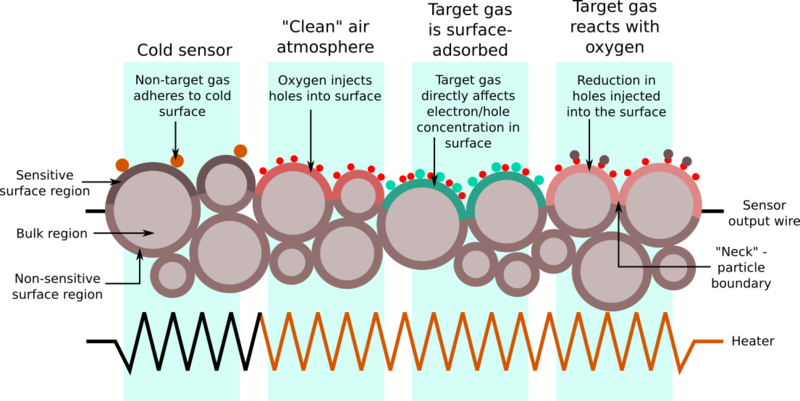 The reactions that can occur on SnO2 surface are adsorption and catalytic reactions, which basically mean that the gas molecules can be adsorbed onto the surface or can catalyse reactions (trigger or enhance them). They take place at the so called active sites or grain boundaries, which are areas where the grains that constitute the sensor resistance are in contact with the air (e.g. with metallic contacts). Hence, metal oxide substrate is basically a collection of sites at which different molecules can be absorbed and therefore interact in various manners with the species present in the atmosphere: either through catalytic reaction, surface reaction, grain boundary reaction (among others). 2. RED sensor resistance decreases in the presence of CO and hydrocarbons. OX sensor resistance increases in the presence of NO2. Finally, the chemical reactions within the resistive element are directly related to temperature and follow an Arrhenius equation type of behaviour. Each sensor's type has a different optimal operation temperature, which is translated into different heating powers for the heater element. Depending on the heating power and transition speeds, different reactions can be facilitated and this can lead to positive effects such as sensor clean up or battery compsuption savings, for example, when heated up in a pulsed profile. On the other hand, it can facilitate sensor poisoning or ageing, which highlights the need of proper sensor characterisation. The SGX4514 is a low cost sensor originally ment to detect instances or trends of target gas in the atmosphere 45. The applications intended for these sensors are ‘event sensing‘ applications and the level of accuracy required is not necessarily within regulatory standards. Furthermore, these sensors should not be used with safety related issues. Peterson et al. 1 describes the various types of interactions between atmospheric gases and a MOS sensor surface. In the image above, the leftmost region describes the unpowered behaviour, or base resistance. The three other regions of the diagram describe different processes that actually occur simultaneously to varying degrees. The sensor’s output is the resistance across the whole of the sensor material, which forms a resistor network with contributions from both the bulk and surface regions. The model described in 1 also explains the wide variation in base resistance between individual sensors of the same type, as the random nature of the surface geometry means an equally random network of resistances. This diagram is a two-dimensional representation of a three-dimensional material; in an actual sensor, the sensitive region is spread into the surface with a distance dependent on the grain size and arrangement resulting from the sintering. Each sensor will then have a different resistance in air and how much this baseline resistance changes with the concentration of the target gas will also differ (what we defined above as sensitivity). Therefore to convert from resistance readings to concentration it is necessary to derive a calibration curve for each sensor. This will require measuring the resistances in air and at a number of gas concentrations over the desired range. It is important that the concentrations are in a background of air as Oxygen is needed for the sensor to work correctly. As stated in 2, the sensor’s response is only partially a function of the amount of gas to which the surface is exposed. Instead, the sensor will have a baseline resistance that is related to the bulk and particle boundary resistance. Because of the random geometry of the granular sensor surface, the baseline resistance will vary between individual sensors. The change in resistance with the change in gas concentration is generally not a linear response. The response can be measured and fitted to a polynomial relationship, with interactions from other metrics such as temperature, humidity and other gases. It has been proved that air flow around the sensor yields better sensor reactivity, and that the usage of PTFE filters also helps reducing cross-sensitivity and sensor poisoning. An important practical consideration with any in situ air quality sensor design is ensuring adequate flow of sampling air through the device. Stale air inside a casing will produce unrepresentative results, and even sensors mounted outside a casing might not get a properly-mixed sample. Although the deployment of multiple different sensors can compensate for the cross-sensitivity issues in calibration, it cannot eliminate it. MOS sensors can thus be used only in situations where any interfering species can either be measured by other means, or they must be calibrated regularly and used in locations where the background varies in concentration slowly compared with the target gases. As well, the sensor drift over time is an important issue that requires sensor recalibration over time. There are two major factors in the longevity of a sensor’s calibration. The first is the natural degradation of the heater element, which becomes hotter over prolonged use and causes the sensor’s response profile to vary. The second is the effect of slowly-varying interfering gases, which over the course of months shifts the sensor’s baseline. The first problem may have an engineering solution, but the second will involve taking the results of the tests in an artificial atmosphere, identifying the most critical species and either measuring or possibly modelling their likely concentrations during deployments. An analytical approach to counteracting this drift might be "merging calibrations", where a sensor is calibrated at the start and end of a four-month campaign, and the coefficients gradually change from one end of the experiment run to the other. The use of deployment campaigns is of utmost importance in order to develop sensor models that are reality proof. With the possibility of collecting the data with the SmartCitizen Platform and the data treatment provided by the Sensor Calibration Framework, we are able to iterate over the different sensor calibration possibilities, ranging from Ordinary Linear Regression or more advanced techniques such as ML models such as LSTMs networks. University of Bologna: data collected from 23/January to 13/February. The measured pollutants with reference equipments were CO, NO2, NO, NOx and O3. Two prototype Smart Citizen Stations were deployed in two different sites, with two Smart Citizen Kits. This test campaign contains a short amount of data to be used as a training dataset for a LSTM algorithm. Therefore, this is just to considered as an use case example and further tests and data should be carried out to train broader models. The Smart Citizen has received funding from the European Community’s H2020 Programme under Grant Agreement No. 689954.